#POPxoWaliHoli: A Dermatologist Weighs In On How To Enjoy Holi Without Damaging Your Hair! Don't we all love to play Holi? I know I do! The fun pool parties and rain dances, hours of drinking thandai and goofing around all day is something I definitely look forward to once a year. If there's one common concern most women have after Holi, it's hair damage. This is primarily because most people don't use organic colours. The colours that we end up playing Holi with are loaded with chemicals and artificial colours. So a dry, irritated scalp along with dull, lifeless hair is a pretty common problem. So how do you enjoy this festival without ruining your mane? We spoke to Dr Harshna Bijlani, Medical Head of The Ageless Clinics, to give us some haircare tips pre and post Holi. Dr Harshana recommends oiling your hair as much as possible. Use a light-weight cold-pressed oil like almond or jojoba. When you oil your hair and scalp generously, the oil creates a barrier on your hair and scalp. The barrier doesn't allow the colours to penetrate through and stain your scalp or damage your hair. The oil makes sure that the colours just sit on top of your hair. Braid your hair and tie it into a bun or a plait to keep it out of harm's way. "The minute you finish playing, shampoo your hair. You may need up to two washes to get rid of all the colour. Don’t skip conditioner because your hair will need that extra hydration. Once you've towel dried your hair, apply some leave-in conditioner or hair serum." says Dr Harshana. Most experts recommend oiling your hair a few hours before you step out to play. And while it's not rocket science, it works! The best way to get all of that colour out of your hair is to stand under running water for a few minutes to allow the colour to rinse off. Once this is done, use a generous amount of shampoo and massage your hair. You want to make sure you *really* spend time massaging and working the shampoo onto your scalp and lengths. 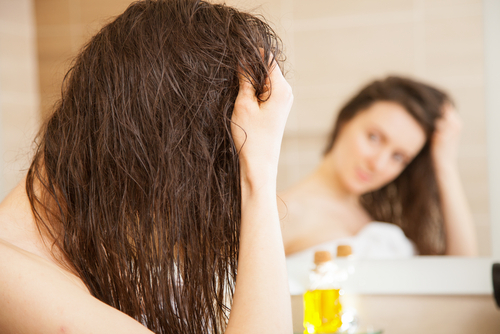 If you have a lot of oil and colour in your hair, you might want to let the shampoo sit on your hair for about 5 minutes. Rinse it off with warm water and shampoo a second time if you still have oil and colour left. The next step would be to use a deep conditioner on the entire length of your hair. After the vigorous shampoo-sesh, your mane will definitely need a little hydration and that's where conditioner will really help. Let the conditioner sit for 5-10 minutes if possible, and rinse with cool water. Your hair should bounce back to normal in about 2 washes. If your hair still feels a little lacklustre during the week, use a deep conditioning hair-spa treatment or leave your conditioner in for a few extra minutes every time you shampoo! If you have coloured hair, it would be best to avoid playing Holi. You're not supposed to oil coloured hair, this is because oil is harder to remove from your hair and you need to use regular shampoos. Regular shampoos are not sulphate-free and end up stripping your hair of colour. If you have light hair or blonde highlights, there are chances of them changing colour after Holi. Now that you know the best Holi haircare routine, we hope you have a safe, fun and colourful #POPxoWaliHoli!